Carol was literally chewing up her palate! Her lower front teeth had over-erupted so far that they hit her gums and nothing else when she would bite. 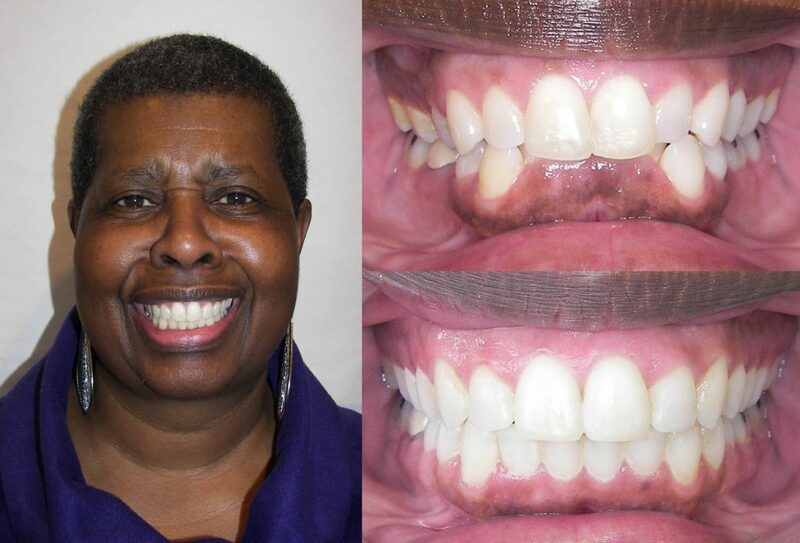 Not only did she not like the appearance, she was tired of always having sores behind her front teeth. The challenge in this case was to bring her lower front teeth down to the same level as the neighboring teeth without those neighboring teeth erupting and thereby changing her bite. I tell people all the time that orthodontics is somewhat of a tug of war: if I am pulling a tooth down, it is also pulling the tooth next to it up, and after that tooth moves, it will pull the next tooth up as well. We couldn’t allow this in Carol’s case because it would create an undesirable bite situation. To Increase our ability to move only front teeth down we used two small temporary mini-implants placed in her lower jaw to stabilize lower side teeth as we moved the front ones. After I placed the first temporary implant, Carol didn’t believe it was in. Treatment progressed well and went exactly as planned.